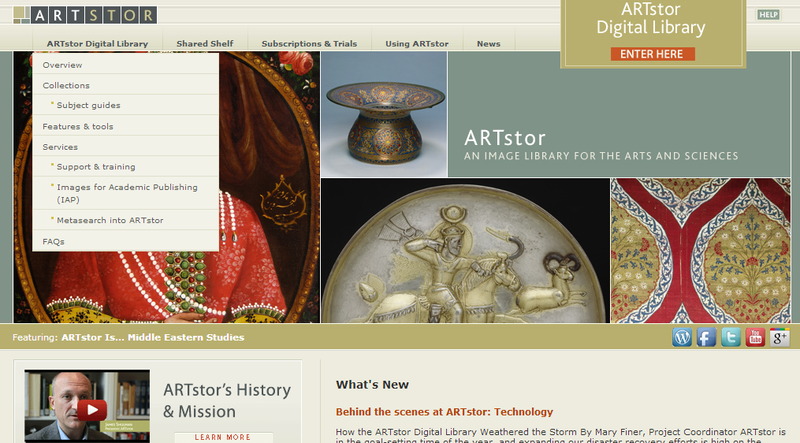 ARTstor is a database of images, including fine art, photography, architecture, sculpture, jewels and other artifacts, ancient art and indigenous art and artisanal works. Please keep in mind that some of the images in ARTstor are copyrighted, and all of them are made available under a Terms of Service that prohibits certain kinds of use even if the original artworks themselves are in the public domain. For more information, see Permitted & Prohibited uses. Pay attention to instructions on cookies, setting screen resolution and disabling pop-up blockers. Click the Enter Here button at the upper right. 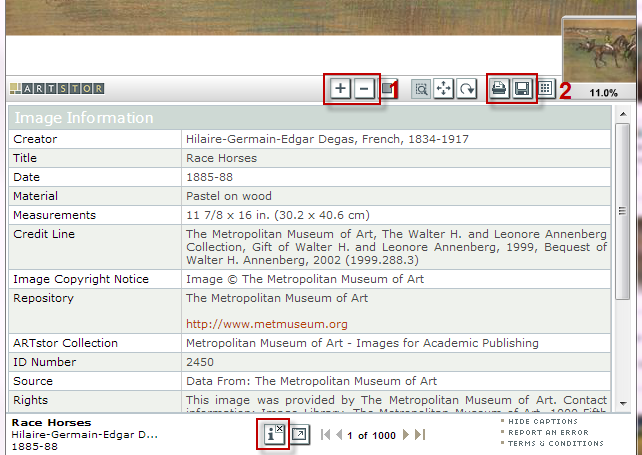 There is a basic search box on the ARTstor main page. Type in words or phrases that describe the image you wish to locate. If your search returns more than 300 results, you will be prompted to refine your search further. 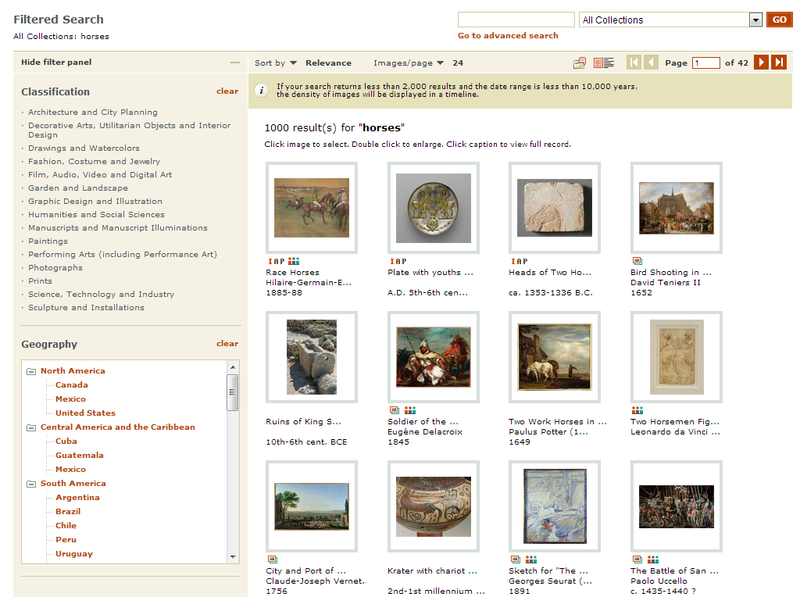 To get to Advanced Search: Go to the ARTstor main page and go to the menu at the top, click Find, and then select Advanced Search. Enter your keywords in the search boxes just as you do in Basic Search. Use the pull-down menus to the left of the search boxes to select whether to join the keywords in the windows with AND, OR or NOT. Use the pull-down menus to the right of the search box to select whether you want to searcy by the creator of the work, the title of the work or "in any field" for a general keyword search. Underneath the search boxes, you can limit your search by date or time period. 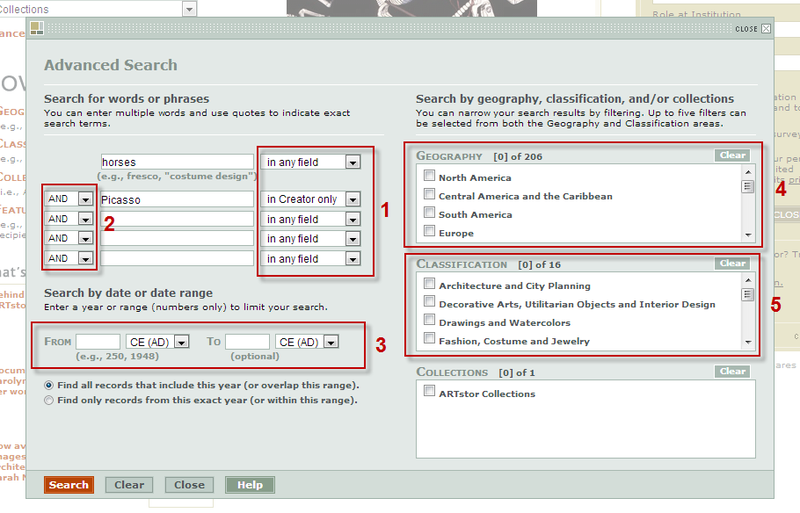 On the right side of the Advanced Search window, you can choose geographical areas and subject classifications within which to search. Click the Search box when you have entered all your information and want to see your search results. Classification (such as architecture, paintings, performing arts or science). To view the full-sized image and image information, double-click it. Then, to view image information click the little i button underneath the full-sized image. Images in your search results list display as thumbnails (miniature images) on the right side of the page. Use the + and - buttons at the bottom of the image to zoom in and out. There are print and save buttons at the bottom of the image. Follow the instructions above for viewing results. Click the print icon (looks like a little old fashioned printer).